Kelly Clarkson, who has been dating Reba McEntire's step-son, Brandon Blackstock, announced their engagement over the weekend and tweeted a photo of her ring. 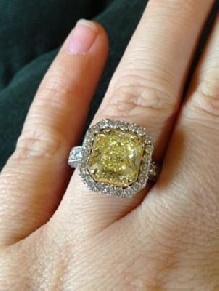 It's a big yellow canary diamond, surrounded by smaller white diamonds, as you can see in the photo here. She wrote, "Brandon designed it with Johnathon Arndt! They did an amazing job! I can't wait to make Brandon's ring with Johnathon as well!" No wedding date has been announced yet. Maybe they happy couple will decide to tie the knot in Wisconsin, when she's here for Country JAM in July? Wouldn't THAT be awesome? Do you know what I like best about the photo she tweeted? Kelly doesn't have crazily manicured fingernails that look like claws, as so many other celebrities do. She's such a down-to-earth person and that is a telling sign of that as well.